Judge Susan Kelsey did not always plan to be a judge. She did not always plan to be a lawyer. She did not come from a family of lawyers, didn’t know any lawyers, and never even dreamed of college while she was growing up outside a small town in central Ohio. While she was growing up, her father worked for the state highway department, and her mother was a homemaker. No one in her entire family had attended college. What Kelsey did with her degree was work as a secretary in an automotive holding company in Birmingham, then as a legal secretary in a private law firm. While working as a legal secretary, she began to read law school text books. Although many law students may find this a tedious exercise, Kelsey found it fascinating. It was that experience that drove her to attend law school. She completed her first year at Cumberland School of Law, where she graded on to law review. She then transferred to the University of Florida in Gainesville, where she student-taught legal research and writing and was elected editor-in-chief of the Florida Law Review. I remember [Judge Kelsey] as a beautiful young lady by whom I was often intimidated, not just by her physical presence, but by the strong arguments that she would make in opposition to some point of law, or strategy on appeal, or otherwise on which we disagreed. I cannot remember a single time that I prevailed in any of these disagreements. Soon, I quit arguing and just listened and quickly adopted her position. Another former law partner, Susan Stephens, recalls Kelsey was her “self-appointed mentor.” Not only was she a brilliant lawyer, she was also willing to devote her time to helping younger lawyers advance as women in the law. Kelsey was one of the first women to utilize a part-time schedule at the firm after her daughter was born, and she was instrumental in drafting the firm’s first parental leave policy. After returning to full-time work, Kelsey mentored other young parents, supporting their decisions to cut back work hours and offering advice on juggling children and balancing family life with work. After 17 years with Holland & Knight, Kelsey handled appeals for two years in the panhandle-based firm now known as Keefe Anchors & Gordon. She opened her own firm in 2007, the Kelsey Appellate Law Firm, P.A. During her nine years as a solo practitioner, large clients such as Shands Hospital and the University of Florida Board of Trustees entrusted Kelsey with many of their appellate needs. Stephens recalls that after Kelsey started her own law practice, other law firms would frequently call on her for appellate advice. In fact, after Stephens moved to a different firm, she could think of no one else to call but Kelsey when one of her largest clients insisted on presenting oral argument in his case when he had never presented argument before. Kelsey selflessly agreed to conduct an oral argument “boot camp” for the client. And while his argument did not ultimately carry the day, Stephens recalls it was far from the disaster it could have been had Kelsey not stepped in. Barnett recalls how successful Kelsey was at transitioning from a large firm with unlimited resources to a one-woman firm with no administrative assistance. Barnett commented on her own abilities—she joined a large firm because she knew she could practice law successfully but could never keep herself stocked with pencils and pens, pay bills, file briefs, and handle client trust accounts. Yet Kelsey did it. With ease. In 2008, Kelsey received a call from Judge Kahn asking her to serve as the President-elect of the newly-created First District Appellate American Inn of Court. She accepted the invitation, served as President of the Inn the following year, and continued to serve on the Inn’s executive committee, becoming a team leader after taking the bench. Having spent her entire legal career practicing appellate law, it is no surprise she made the transition to appellate judge. But that move was not as easy for her as the rest of her career moves seem to have been. Judge Kelsey applied five times for the position, sometimes never emerging from the judicial nominating commission process, before Governor Scott finally appointed her in April 2015. Judge Kelsey notes her work now is similar to what she experienced in private practice. As an appellate lawyer, she spent her entire career reading briefs, analyzing cases, and writing up the results of her analysis. The difference now is she is no longer an advocate but an umpire. After spending almost a year on the other side of the bench, Judge Kelsey’s biggest surprise has been how hard appellate judges work. Describing her typical day, she notes the process differs little from private appellate practice. There are still voluminous records to digest and cases to analyze. But for someone like Judge Kelsey who describes her work ethic as “accomplishment-driven,” it has been challenging to learn that an appellate judge’s work is never done. While current and former appellate law clerks may remember briefing eight or ten cases per month, it is nothing compared to the case load of a district court judge. In an average full month, Judge Kelsey has primary responsibility for 16 new merits cases and secondary responsibility for 32 additional merits panel cases. She also decides 20 to 30 writs and motions cases, 10 to 25 cases summarized by the court’s staff attorneys, and dozens of motions filed in pending cases—not to mention sitting on oral argument panels and resolving cases still under review from prior months. “The work is infinite,” she says. But she loves the intellectual challenge. Having practiced solely in civil appeals, the criminal procedural issues are new to Judge Kelsey. But she is not one to shy away from any challenge. Perhaps that is why she works even more hours now than she did in private practice. Judge Kelsey generally spends eight or nine hours a day working at the courthouse, five days a week. She also works at home most nights and weekends, and takes work with her when she travels. Any lawyer who thinks appellate judges only read law clerks’ bench briefs is wrong when it comes to Judge Kelsey. That is usually the last thing she reads. To her, the bench brief is a good check on her own analysis, and is helpful to keep track of complicated issues. Judge Kelsey reads the entire record in every case on which she is primary or in which she intends to write an opinion, and all pertinent portions of the record in each of her panel cases. She then reads the briefs and relevant legal authorities, arriving at her preliminary conclusion before ever consulting the summary prepared by her clerks. Regarding oral argument, Judge Kelsey takes it very seriously. Advocates can feel confident that if Judge Kelsey is on their panel, she will know the record and the law. She generally takes at least three days to prepare for oral arguments—reading the record, the briefs, and the relevant legal authorities. While as the junior judge she sometimes finds it hard to squeeze in questions, that does not mean she is not prepared. Her diligent preparation has, on occasion, left her more familiar with the case than the presenting attorney. She reports that she was always very nervous before delivering oral arguments and sympathizes for anxious advocates. “It is okay to be nervous,” she says. And she has frequently helped advocates along by tossing them softball questions in an effort to help them effectively present their cases. When looking at Judge Kelsey’s accomplishments, one may mistakenly think she has been completely focused on her career. They would be wrong. 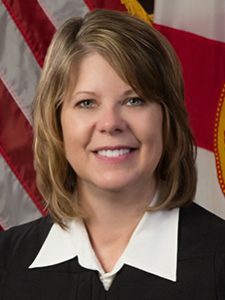 While working long hours at a large private law firm, and eventually branching out on her own, Judge Kelsey also dedicated a large amount of her time to raising a family including her daughter and two step-sons, who are nearing or finished with college and excelling in their academic and employment endeavors. Her husband is a partner and state and local tax attorney. Judge Kelsey also actively supports her church activities, even including obtaining her commercial driver’s license to drive the church bus for youth group events and local outreach activities. She enjoys reading and antiquing when she can. For the past two years, in her spare time, Judge Kelsey and her husband have been renovating a 1950’s ranch-style home and then furnishing it with a retro-1950’s flair (think Mad Men chic). It appears Judge Kelsey enjoys seeking out period furniture and accessories almost as much as she enjoys seeking out the truth in the law. When asked whether she had any advice for practicing attorneys, she had two emphatic words to say: “DO BETTER.” Appellate judges really do care how you write. They care how you spell. They care about grammar and sentence structure. Most of all, they are disappointed when attorneys have not done their research, have not completed an in-depth analysis, or have tried to hide the ball. Appellate judges have high expectations for appellate lawyers. They dedicate an enormous amount of time to analyzing and deciding your case, and they expect you to do the same. Appreciated attorneys conduct diligent research; write clear, concise briefs; and deliver relevant, fair oral arguments. Really appreciated attorneys use helpful organizational tactics such as headings and subheadings in their briefs, and even include hyperlinks to the table of contents, appendices, or other materials they want the judges to review. Nearing completion of one full year on the bench, Judge Kelsey seems perfectly settled in her new suite at the First District. Her desk is not free of papers, but it is arranged in perfectly organized stacks. Her chamber reflects her tastes in that it is efficient but still comfortable, including a few select pieces of antique furnishings and artwork. Perhaps most importantly, she has almost learned her way around the courthouse’s unmarked and unadorned corridors despite the lack of landmarks. She confesses, however, that if she has to set off into unfamiliar courthouse territory, she still carries a floor map with her, just in case. While she did not imagine this career path as a young girl growing up in rural Ohio, the people she has touched during her legal career are extremely appreciative she chose this route. Shrewd, sage, selfless, scholarly, and steadfast. Judge Kelsey sets high standards for herself and she lives up to them. The First District Court of Appeal and the lawyers who practice there are very fortunate to have Judge Kelsey on the bench.